The Humane Society of Sheboygan County is announcing the public kickoff to its’ Capital Campaign for the building of a new shelter. The current shelter at 3107 N 20th street was built in 1964. It has served its’ purpose but outgrown its’ efficiency. It is too small to handle the 3,000 animals that come through the doors annually. HSSC is a nonprofit organization, not supported by local or state tax dollars. The new building will be built on adjacent property that was donated by the Muth family. In addition to providing adequate space the animals, it will provide so much more for the community. It will include a surgical suite that will allow the Humane Society to make a greater impact through increased spay and neuter services, and an increased Trap Neuter Return program, as well as taking care of the numerous daily surgical needs. The new shelter will have a more efficient flow for employees and volunteers creating a better work environment for both. It will also be more inviting and user-friendly to the public. Starting with visibility on a major road and continuing inside with quieter, more intimate animal rooms, and a catio, where the public can sit amongst the cats and relax with a book or have a cup of coffee. 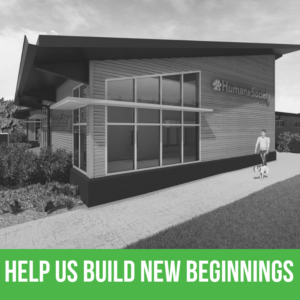 The new building will have a retail store that will allow adopting families to meet all the needs of its’ newest member and finally, it will have a community room that will allow more people to experience the Humane Society. The community room will be a place to hold meetings, day camps, birthday parties, polling for elections, and other similar gatherings. Steve Schmitt, President of the Board of Directors, said “Sheboygan County is such an incredible community when it comes to charitable causes. We ask Sheboygan County to once again step up and make a difference. A viable and efficient Humane Society will be a great piece of what makes Sheboygan County special.” The goal for the campaign is $4 million with almost 50% raised. We need your help to reach our goal. This is the first time in 55 years the Humane Society has initiated a Capital Campaign. The public phase of the Capital Campaign will kick off March 21st. The first event is at 3 Sheeps Brewing Company on March 23rd and is followed by a fundraiser at the Black Pig on March 31st. There will be more events throughout Sheboygan County over the next few months to continue generating excitement for the campaign. Please contact Andrew Viglietti at andrewv@scadopt.org or visit our website www.adoptsheboygancounty.org/capital-campaign/ for much more information.